We provide Classic Designed and gorgeous new Easy to Carry Rolling Pilot Case of Disney's Product. That Rolling Pilot Case is the perfect transport with its rolling wheels and fun design. Made of high quality durable material and zipper closure. Disney Cars Brand New Classic Designed Dependable Black Retractable Pull Handle Excellent Kids Roller Pilot Case 16 inch. This could be a cute roller case for back to school or even for summer/weekend travel. Little boys will love going on an adventure with this Cars pilot case. Your child's favorite movie characters can now go everywhere with him/her and it is sure to bring a smile to that precious face you love so much! Stylish and convenient, your child will love how easy travel and school is going to get! Don't forget about the relief you will feel to have your child's many valuables organized and safe! 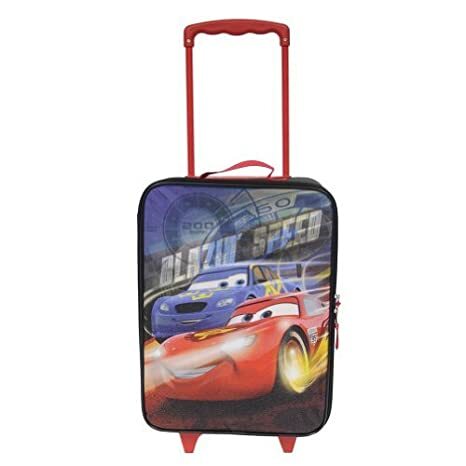 This Disney Cars Rolling Pilot Case is the perfect transport with its rolling wheels and fun design. Kid's likes most its beautiful design, convenience and many special features. This magically wonderful Disney pilot case will bring that little extra flair to your child's life. When you don't have any pixie dust to sprinkle on the kids, lift their spirits with an eye-catching piece of Disney memorabilia.